According to a recent study, 32% of the population is in favor of the niqab for women. Only 2 % want to be free of all head coverings. For the majority wives must obey the husband, and only 7 % believe that marriage should be based on love. 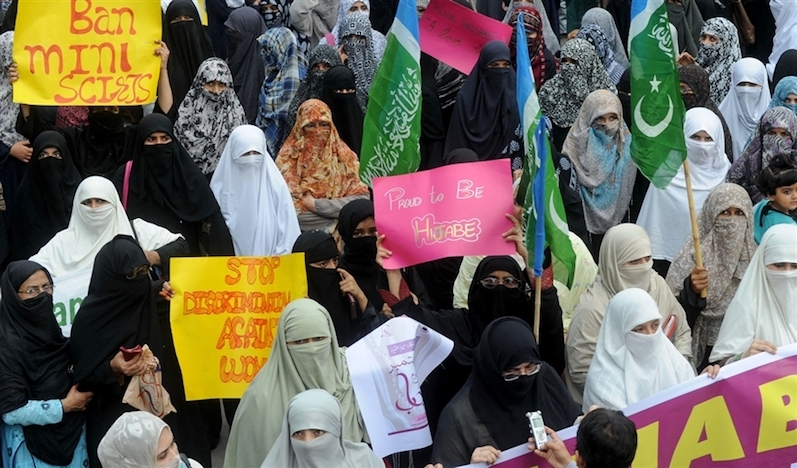 Criticism of civil society, Muslim activist: women must be 'free to wear what they want". Faisalabad ( AsiaNews) - Activists , civil society, Christian and Muslim leaders have repeatedly denounced a gradual " Islamization " of Pakistan in recent years, marked by terrorist attacks and attacks on schools, as well as threats against individuals involved in the struggle for human rights and civil liberties. A recent survey prepared by the Population Studies Center of the University of Michigan (United States), and based on the answers given by the citizens of diverse Muslim countries in the field of women's clothing, seems to confirm this trend. Citizens of the Asian nation believe women must cover their faces (or at least the head ), wearing the niqab or abaya , and only 2% of respondents ( 51 % of whom are men) believe that women can be seen in public with their faces and hair uncovered. The university scholars conducted their research between 2011 and 2013, examining the inhabitants of seven different Muslim majority nations: Tunisia, Pakistan, Egypt, Iraq, Lebanon , Saudi Arabia and Turkey. Starting from the question of how women should appear "in public" to be morally "appropriate" and consistent. Respondents were shown six different images that depicted a burqa , the niqab, three different forms of the veil (more or less adherent), and finally an uncovered woman's face. Of the more than 3 thousand respondents in Pakistan , 32% chose the niqab; the abaya was the second choice with 31 % of the vote; only 3 % want the burqa; a meager 2 % no covering . In general, in the seven Muslim states picture showing a woman wearing a veil that leaves only the face uncovered prevailed. Only in Lebanon, the majority (about 50% ) opted for the woman with their hair and face uncovered . In Pakistan, only 22 % believe that women can "dress as they see fit", while more than two thirds are in favor of precise directives in the field of clothing; finally , 92% of respondents felt that wives should "always" obey husbands and only 7 % believe that marriage should be based "on love". The results have sparked criticism and comments from activists and members of civil society. Interviewed by AsiaNews, the leader of the Christian youth Aila Gil says that "women should be able to dress up as they wish. it's their fundamental right, we are living in a society dominated by men where women lack the freedom to make small choices even they have their dress dictated by men". The young pacifist leader and human rights advocate Yousaf Benjamin says new generations must " bring a change in mentality ," hoping at the same time for "a future based on human dignity and freedom." The Muslim political activist Iftikhar Ahmed has some doubts about the quality of the investigation, because it is a "cornucopia of conservative thinking. The veil system in Islam has no roots at all. Women have full right to wear whatever they want so I totally disagree these kind of surveys and conservative thinking". In contrast , the survey results are not surprising at all for feminist Nazia Sardar because they are a mirror "of the scenario that we have created over the past five decades." She hopes for the removal of all "discriminatory" laws and policies marking gender "differences" in society. "Such kind of study is the clear picture of the product which has been produced by the education where we feed the mind of a child from childhood that women are less than men and they must be controlled by men". For Shazia George , on the other hand , people should cover their faces " only in places of worship", while the practice "should be discouraged in the open spaces and public places for security and anti- terrorism reasons". These fears are also shared by activist Amina Zaman , according to whom "you can not know " who is behind a veil, it is "male or female" , and this practice would ultimately " encourage terrorism and provide a shield for supposed terrorists. "